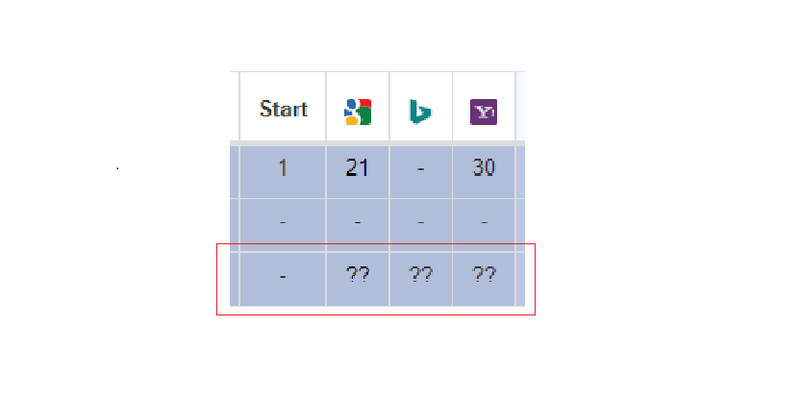 I see my website ranking on Google but I only see "??" and "-" on Serpbook.com, can you tell me how to fix this? If you're seeing “? ?”, this means the queue is being updated. Doing an on-demand update should fix this and show you the correct and current rankings. 1. Verify that the URL is spelled correctly. Please double check if the URL is spelled correctly and click on the link to see if the link directs you to the correct site. 2. If you have performed a Manual Search, please make sure that the URL on your Manual Search Results matches the URL being tracked by Serpbook. 3. Check whether the "exact" option is enabled. If the URL indexed by Google has a trailing "/" (for example, www.serpbook.com/serpbook/ ) but you're inputted URL doesn't have a trailing "/" (for example, www.serpbook.com/serpbook ), Serpbook will not register the ranking and it will return unranked ( "-" ). If you are tracking a Facebook page with the "exact" option enabled, and the URL indexed by google is en-gb.facebook.com/serpbook/ but you entered www.facebook.com/serpbook/ on Serpbook, Serpbook will not recognize the URL and will mark it as unranked. Please perform an on-demand update and check if the rankings are still the same or if they have corrected themselves.